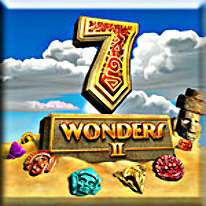 Welcome Back to the Magnificent World of 7 Wonders! Enjoy challenging match-3 gameplay in an extraordinary, newly enhanced environment where you work day and night to build the magnificent wonders of the world. Blast stone from the game board to workers busily gathering materials below by matching three or more relics in a row. Strategically move key building blocks such as cornerstones down the board to the workers before time runs out. Earn exciting power-ups and bonuses that help clear the board in fantastic fashion, and receive pieces of a hidden map, which ultimately uncovers a secret route leading to more mysterious wonders!